Well, my little lovelies, guess I ought to share the other quilts (that did not sell - poo!) I had hanging in the Bulloch Hall Quilt Guild Quilt Show. 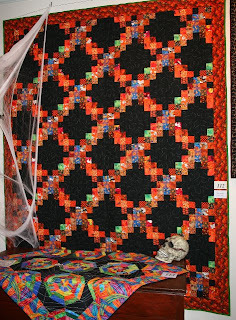 'Irish Halloween' is a great quilt! It has a history and everything!!! Got the top on ebay. Yes, bought the puppy off the internet. (Yes, I'll admit ANYTHING!) And that's one way to get a top done really quick. The wonderful green for the backing and the binding was found at Quilting Possibilities on a great road trip with the BFF Betty and Louise. 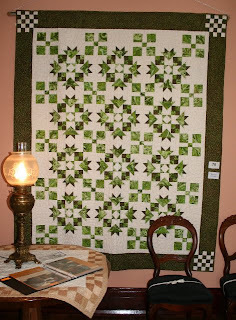 We were looking for a perfect back and Louise, non-quilter that she is, pulled out this perfect green with tiny yellow stars. It was a WOW moment. It was the perfect piece. And then Betty and I quilted in on Bert (my sold long arm) using a black and white verigated thread. Looks like worms or cobwebs all over the quilt. I love it!!! 'Frogs In A Blender' is another quilt with a story. Betty and I attended the Quilter's Rescue Mission Retreat in Toccoa, GA. We took a mystery class and this is what came out. If I had known in advance (but then it wouldn't have been a mystery, would it?) I would have definitely done a better job with the points. But in the 'I don't really care THAT much' school of quilting, it'll do. We found the fabulous swirly batiks at Sew Memorable - yeah, another road trip. . .
Betty did one, too. Of course, she gave her quilt a sweet name 'Blue Swirl'. Could use a quirkier name but it is stunning anyway. Yeah, and the over-achiever made pillow cases, too. I have those plans AND the fabric. I'll get to it some day. 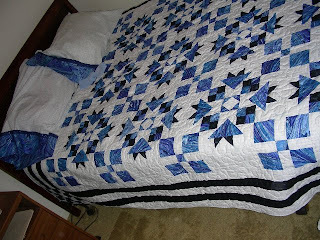 . .
Now the deal is, my quilt is on my guest bed so Betty can sleep under it when she visits me from Michigan and she put her quilt on her guest bed and I will sleep under it when I go visit her. Very cool!!! And I said I sold Bert. Well, money did change hands but I prefer to think that she went to live on a farm - oops! That was the dog from Friends. She was 'adopted' by a close and well trusted friend. I did a home inspection first and interviewed the family. She will be loved and well cared for. AND, the incredible artist who now owns her is ALREADY 10 times as talented with her. I am humbled. . . .